The foundational software on your server is the operating system. Generally speaking, it’s the basis on which everything else you use runs. Without an operating system, your server is just a collection of electronics that does not know how to communicate with the rest of the world. How do you choose the option that is best for you when buying web hosting? What is the difference between Windows servers or Linux servers? Does your choice impact how much your web hosting account costs? Are there alternatives to Linux and Windows? For those who are new to this area of web hosting, you can think of operating systems the way you would when purchasing a new personal computer. In a few instances, you might find yourself looking at a machine that runs none of the options listed above, but this is not a common occurrence. Most consumer workstations are capable of running many cross-platform languages and technologies, including PHP and a wide variety of cloud-based tools. Remember, operating systems are also not limited to just computers. Your smartphones and tablets, for example, also run operating systems, such as iOS or Android. When purchasing web hosting space, you’ll need to make the same decision regarding which operating system you will use. However, the decision process involved in choosing an operating system for your everyday computing is different from the decision process involved in choosing the operating system that will run on your server when purchasing a web hosting package. Not only are the options slightly different, but you’ll also need to consider a different set of factors because you do not use a server the way you would a personal computer. What, Exactly, is Web Hosting? When you purchase a plan from a web hosting company, you are essentially purchasing space on their server to store your website. Depending on what you have purchased, you have a small allocation of the server’s total resources available for your use (such as with a shared hosting plan), or you have the entire server available (as in a dedicated server). Between these two extremes, there is a continuum of options available. However, the discussion of which option is best for you is outside the scope of this article. You’re best off reading our in-depth hosting comparison pages. A2 Hosting is a good example of a wide range of hosting packages. Are Servers and Hosting the Same Thing? We may occasionally use the terms server and web hosting interchangeably, though there are obviously varying levels of differences depending on which plan type you purchase. For example, if you purchase a shared hosting plan, talking about a physical server might include more than you have access to. Regardless, this article will be general enough for users of all types of web hosting. Which Operating Systems Are Available For Servers? When it comes to operating systems for web hosting servers, we can ignore Macintosh itself and focus on the Unix-like operating systems (most often Linux) and Windows. Before we dig into the main differences between Linux and Windows, let’s look at where Linux came from. Unix development began in 1969 at Bell Laboratories (which was under AT&T ownership). Over time, the rights to Unix have been sold many times, and many have developed Unix-like variants. The variants based on the original Unix systems can be classified into two types: branches and derivatives. One of the most impactful branches of Unix today is called the Berkeley Software Distribution (BSD). A branch of Unix, BSD has not been updated in many years. However, one derivative of BSD is Apple’s macOS, which is the most commonly-used Unix system (though it is not frequently used on servers). There are some derivatives of BSD that are free and open source (and therefore not proprietary like Macintosh), such as FreeBSD and TrueOS. The field of Unix derivatives is where things get interesting. One of the Unix-like variants that have become very commonly-used on servers is Linux (sometimes referred to as GNU/Linux due to the fact that many Linux distributions ship with numerous utilities and libraries, many of which originate from the GNU project). Linux was originally designed to be a free and open source alternative to Unix, and its status as such continues today. When it comes to Linux, there are different distributions available (the word distribution is used to mean variant in the Linux world). Though all are Linux, individual distributions can be quite different from one another. If you purchase a shared Linux hosting plan, you probably will not be able to choose the specific distribution that runs on the Linux server hosting your website. All you know is that you are getting a Linux host. Siteground is top host offering Linux plans. Once you get your head around the above, even at a basic level, you’ll be in a better place to start. There can be a lot of flux in the Linux world, so when choosing your operating system “flavor”. Be sure to look into how long current versions are supported. In some cases, this support may last a long time (such as ten years or more). In other cases, such support may only last six months. Furthermore, a discontinued operating system distribution might still be a good option. For example, Red Hat Linux, a variant of Fedora Linux, has been discontinued since 2004. Nevertheless, Red Hat is still used often due to its military-grade security and supported across physical, virtual, and cloud environments. Servers that run Windows are typically using some variant of the Windows Server operating system, which differs quite significantly from the versions available for single-user workstations. Generally speaking, choosing a Windows Server-based hosting plan costs more. This is a result of licensing fees involved with using Windows Server. Having said that, it is not an issue when using the free and open source Linux hosting providers are likely to pass the cost of licensing on to you, the subscriber. You’ll also need licenses for any other Windows products you may use. A2 Hosting offers a decent comparison of Windows against Linux side-by-side. You will also see other differences when choosing a Windows server or Windows web hosting plan. First, you will likely get a SQL Server Database, or MS SQL Server, (instead of the more commonly used open source alternative, MySQL). Second, you will get support for Windows-friendly (or Microsoft-based) technologies, programming languages, and applications, such as the .NET Framework and ASP.NET. Choosing a Windows-based hosting plan is not the default option for most users. Unless you have a compelling reason to do so, such as running applications built on Microsoft’s .NET Framework, you are likely to be well-served with a Linux host. However, if you are dead set on running Windows Server for whatever reason, there is nothing stopping you. In any case, you just might have highly hosting fees on a month-to-month basis. 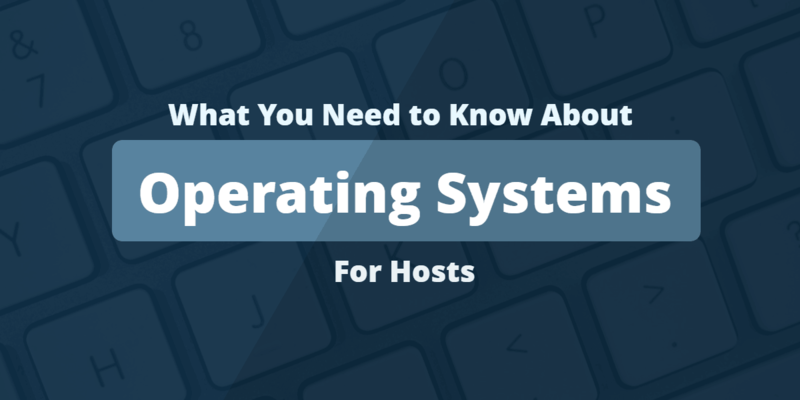 While there are many different operating systems in existence, not all options are available for use on servers and not all hosting platforms offer every option (in fact, most do not). However, we can summarize your options as Linux and Windows. What Hosting OS is Used Most Often? Generally speaking, the default operating system for a server is some form of Linux/Unix. While there are practical reasons for this, such as its robust feature set, scalability, and robust performance history, there are budgetary reasons as well. Linux, for example, is open source and therefore free to use. About 70% of servers are running Linux. Commonly-used distributions by Linux hosts include Ubuntu, CentOS, and Red Hat Linux. Though there are exceptions, applications available for one Linux distribution can be run using other distributions. Is Linux Hosting More Complicated to Use? If you are nervous about your ability to work with a Linux hosting plan, you can rest assured that most shared hosting plans load their servers with user-friendly distributions, such as Ubuntu. While the features and settings you are looking for might be in a different location, the high-level organization and usage patterns are what you might expect from a Mac or a Windows PC — some Linux distributions are closer to Windows, while others are closer to macOS. However, in the decision between Windows and Linux, if you are doing something more specialized, such as running Windows web applications, then your decision is clear: go with Windows hosting. Control panels are graphical user interfaces, such as cPanel or Plesk, that make it easy to work with your server (or server instance). Depending on the operating system, your options are slightly different – for example, certain control panels are available only for Windows users, while others are only available on Linux. If you are familiar already with a given option, and you are planning on switching operating systems, be sure to check for compatibility (unless you are open to choosing a new control panel). Personal OS and Server OS – Should They Match? Not necessarily, although this is dependant on your individual circumstance. Let’s look at a few areas where it might matter. Generally speaking, you can transfer files from a computer running one operating system to a server running another, assuming the file format is readable to both systems. It is unlikely you will need to run something that you have on your server locally. If you do find yourself needing to use that product, the best course of action is to remote into your server and work there. This ability is not generally affected by the operating system on your server or your computer, though you may need to use a different application. If you do find yourself using a product that you need to run both on your server and locally, chances are that your tool is cross-platform (that is, it runs on multiple operating systems, including macOS, Windows, and the more common Linux distributions). If you are just getting started with web hosting services, your options, when it comes to the operating system that runs on your server might be limited to just Linux and Windows. However, more premium packages give you greater flexibility in choosing an operating system. An Ubuntu server can be a good way to get started and to determine what works for you and what does not — it is a product that is easy to find and relatively inexpensive (all good things for testing). You can then determine if you need to move to a different distribution (or even Windows). The specific option that is best for you depends on your use case, but we hope that this article has begun to clarify for you the options that are currently available. Are there hosts that provide Mac OS servers, and why would anyone use them? There are a handful of hosts that offer Mac OS. The biggest reason to sign up for a Mac server is because you plan on using it to develop applications for Mac OS or iOS. A Mac OS host is particularly useful if you have a team sharing in the development or sharing the development space. The other reason is that Mac users really like Mac products. If you can’t live without the OS X Launcher, a Mac OS server will provide a more familiar experience. Do WordPress, Joomla, and Drupal work the same on a Windows server as on Linux? Since all of these utilize a web-based control panel, the user and admin experience will be the same, regardless of the server you’re using. It’s particularly true if you install them using a one-click installation program. Subtle differences will exist in the way certain operations are handled. For instance, PHP handles mail differently on Linux and Windows (on Windows, it has to use SMTP). Thus, if you’re using an add-on that transmit mail (such as a feedback form), it may go a little slower on a Windows server. But you probably won’t notice.